The Legion of Mary is an international association of Catholics who, with the sanction of the church and under the powerful leadership of Mary Immaculate, Mediatrix of All Graces, have formed themselves into a legion for apostolic services. Founded in Dublin, Ireland by the late Frank Duff in 1921, it has established branches in almost every country where the Catholic Church is. An official exposition of the Legion, its laws, principles, methods, and spirit are contained in the Legion Handbook. The Legion is governed by a system of councils. 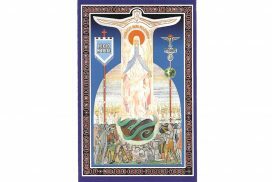 The Concilium Legionis in Dublin, is the central council, being the supreme governing authority of the Legion. It has appointed the Senatus of Singapore, a regional council, to exercise authority on the subordinate district councils called curiae. Each curia oversees the units of the Legion called praesidium under its jurisdiction. The praesidium, Queen of All Saints, at Church of Saint Francis Xavier has its meeting on Mondays at 8.00pm with Br Ambrose Heng of the Brothers of Mercy as the Spiritual Director.